Walk, mountain bike, or 4WD to this little hut on the edge of a working station. Located: At the base of Duncan Valley and Rhoboro Hills, west of Lake Pukaki. Access is from a signposted carpark on SH80 (road to Aoraki-Mt Cook). Map – BZ15. Hut features: Basic 4-bunk ( = free!). Reasonably clean. Good quality woodburner (but there is little wood around, only matagouri, so having a member of your party carry wood/coal could be useful). Some cooking utensils. 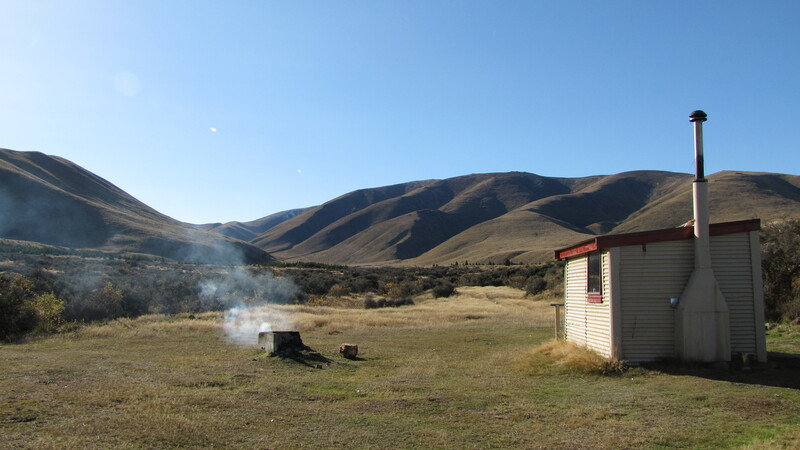 Hut is surrounded by good flat land, so ideal for camping if the hut is busy. Little stream for splashing in close to hut. Negatives: Likely to be busy as easily accessible (hut book notes regular visitors) so we were relieved to have it to ourselves. Walk in is reasonably boring (especially for little ones) and in summer, very hot as little shade for most part. A few sandflies – littlest one got one bite, neither had repellent on. If we’re getting picky – hut floor is uneven so little people may trip easily, no fire guard. Hut is also a little drafty/cold at night. Visited: Clark whanau, Jan 2016 (NB: we had access through neighbouring station so 4WDed into junction with Dusky Trail, walked ~4km).